JUNE 24th- 25th, 2017: The Coors Light South Platte RiverFest presented by Elitch Gardens is Denver’s premier urban river celebration featuring standup paddleboard lessons, sports demos, fitness and yoga classes, live music, water stewardship information, a world class beer garden, food trucks, vendors and much more. The festival will take place in Confluence Park and on Little Raven Street between 15th and Elitch Gardens. Get more details here. JUNE 18th, 2017: On June 17, 2017, Runoff Runoff committee is partnering with the Willow Creek Reclamation Committee, a project of the Headwaters Alliance, to host the Runoff Runoff: Run along the Rio Grande! This event boasts a marathon, half-marathon and 6K! The purpose of the Runoff Runoff is to educate and engage the public in local watershed issues. This annual event is their main fundraiser and helps organize river restoration, diversion replacement and community river projects. For more information or to register, go to their website. JUNE 19th, 2017: Join the Colorado Ag Water Alliance on a full day tour and see a variety of speakers from local producers to the Commissioner of Agriculture. Explore working farms and ditches. See how water is used in irrigation and what farmers are doing about conservation. This event will be at Colorado Corn Office 127 22nd St. Greeley, CO 80631 from 8:00 AM – 4:00 PM. For more information click HERE. JUNE 24th, 2017: 10th Annual Celebration of the Uncompahgre River. This year has been planned for another great festival with some special additions to commemorate its 10th year. Join for a full day of fun, and consider competing individually or with a team of friends in the hardshell kayak, inflatables, standup paddle board or Junk of the Unc races. You can sign up to volunteer for three hours Contact Tanya at 303-819-7784 or ridgwayriverfest@gmail.com. JUNE 27th, 2017: Join the Colorado Ag Water Alliance on this full day tour and see a variety of speakers from local producers to the Commissioner of Agriculture. Explore working farms and ditches. See how water is used in irrigation and what farmers are doing about conservation. The bus tour takes you through Longmont, Fort Lupton and Brighton to see a variety of local working farms, irrigation systems and diversion ditches. Start location - Boulder County Fairgrounds, 9595 Nelson Road, Longmont, CO 80501 from 8:00 AM – 4:00 PM. Go to their website to register. JUNE 29th, 2017: The Watershed Summit (SHED '17). The event's focus on "Water Is Your Business" seeks to add new voices to the discussion, introduce innovative ideas, and break down silos. The goal is to bring local influence to global issues. 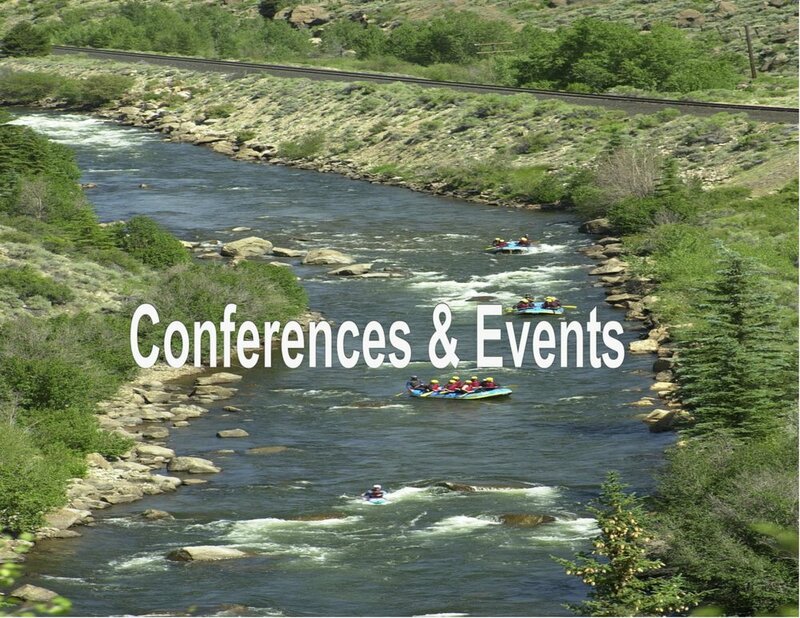 This year's topics include: The Evolution of Water Conservation, Climate Change Under the New Administration, Future Water Shortage: What is Agriculture's Place in the Challenge?, and The Importance of Watershed Health in Recreation. Register here. JULY 7th, 2017: Join the Watershed Wildfire Protection Group at Colorado Parks & Wildlife Administrative Offices; Bighorn Room; 6060 Broadway; Denver, CO. They promote healthy watersheds by facilitating education and awareness; and facilitating prioritization, implementation, and monitoring for people and wildlife. Their vision is to protect Colorado water supplies and critical infrastructure from catastrophic wildfire and other threats by maintaining healthy, resilient watersheds through collaboration, implementation, leveraging, and education. Click HERE for more information. SEPTEMBER 26th-27th: Setting Watershed-Scale Priorities in Riparian Restoration, CMU University Center, Grand Junction, CO. This workshop is being organized by the Center for Colorado River Studies at Utah State University and hosted by the Hutchins Water Center. The goal of this event is to describe tools and strategies that agencies and organizations can use in deciding where to work, what to do, and how to establish appropriate and achievable goals in riparian rehabilitation and restoration. For more information or to register click HERE.